The sale prospects look bright for two of the most prestigious stud farms in Co Kildare. The spirits of the international bloodstock fraternity soared earlier this month after a record-breaking Tattersalls elite October yearling sale, which saw Coolmore supremo John Magnier pay 2.6 million guineas for a Galileo colt—the world’s highest price paid for a yearling in 2014—and a total sale turnover of almost 80 million guineas, a new European auction record. Add to this the gradual revival of Dublin’s prime property market and the continuing injection of money from the Middle East into UK and Irish racing and the sale prospects of several of Co Kildare’s most prestigious stud farms suddenly look a whole lot brighter. Ireland has seen more than her fair share of fallen heroes in recent times and the launch onto the market, in last week’s COUNTRY LIFE (October 15), of Sir Anthony O’Reilly’s splendid, 750-acre Castlemartin stud farm and former family home, near Kilcullen, south Co Kildare— at a guide price of €30 million through Jordan (00 353 45 43 35 50) and Knight Frank (020–7861 1782)—signals the sad end of a stellar international business career spanning more than 50 years. 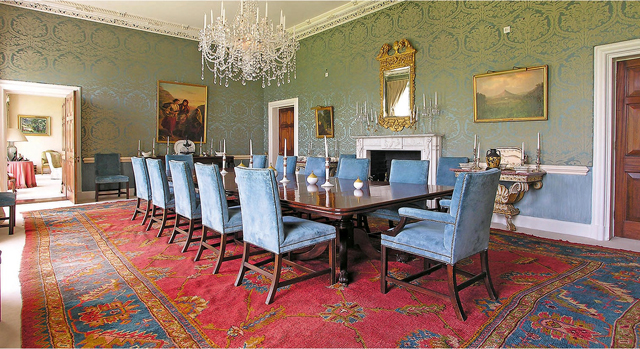 But the style and glamour that were the trademark of Ireland’s first billionaire businessman over the years are still evident in every pristine corner of the historic house and estate that he rescued from oblivion in the early 1970s. Castlemartin stud farm near Kilcullen, south Co Kildare, was rescued from a state of disrepair by international businessman Sir Anthony O’Reilly in the 1970s. €30m. Co Kildare has always been Ireland’s richest county outside Co Dublin and Castlemartin was held from the 13th century by the Eustace family of Barretstown Castle, a prominent Anglo-Norman clan, many of whom were high sheriffs of Co Kildare and privy councillors. Other Eustaces had the misfortune to back the wrong horse during one of Ireland’s sporadic brushes with the English Crown and subsequently lost their heads. In the late 16th century, Castlemartin was owned by a Eustace widow, who married Capt Thomas Lee in about 1580. However, in 1591, the castle burned down, ‘by the means of lewd servants’, according to Lee, after which the property reverted to the Eustaces and was the favourite home of Sir Maurice Eustace, Lord Chancellor of Ireland from 1660 until his death in 1665. The interior of the dining room —and other reception rooms— is grand without being overpowering. 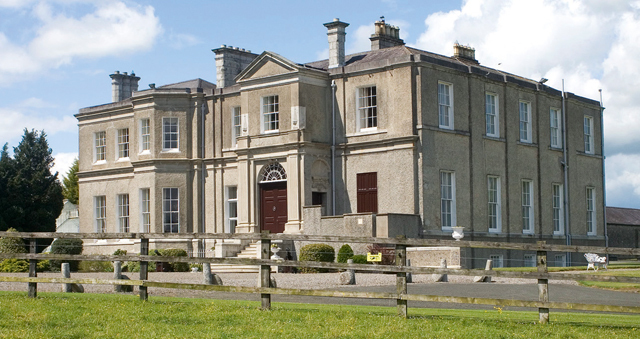 The present Castlemartin House was built in the classic Georgian style in about 1720 by Francis Harrison, a Dublin banker and MP, using stone from the old Eustace castle, a vault of which still forms part of the large wine cellar in the basement. Ten years later, the estate was bought by Thomas Carter, another leading MP, who was appointed Master of the Rolls in Ireland in 1731. He was succeeded at Castlemartin by his son Capt Henry Boyle Carter, who was named after his father’s friend and political ally Speaker Boyle. Castlemartin remained in the hands of of the Carter family throughout the 1700s, before being commandeered by Lt-Gen Sir Ralph Dundas as his campaign headquarters during the 1798 rebellion, resulting in considerable damage to the interior of the house. In 1854, Castlemartin was bought by T. S. Blacker and remained in the hands of the increasingly impecunious Blacker family until, in 1967, Sheelagh Blacker left the estate to her great-nephew, Lord Grey Gowrie. The house was already in poor condition and it deteriorated further until, in 1972, Lord Gowrie sold Castlemartin to Dr O’Reilly. At the time, demolition was thought to be the sensible solution, but, over the next 10 years, Dr O’Reilly spent millions restoring the Georgian mansion, rebuilding the estate’s ruined church, icehouse and other historic buildings and nursing Castlemartin’s lush limestone acres back into shape. Set against the idyllic backdrop of the River Liffey and the surrounding woodland, Castlemartin boasts 750 acres of prime pasture, two large stable yards (89 loose boxes in all), two well-equipped farmyards, 40 paddocks linked by an extensive internal road network and wintering facilities for 400 cattle. It also offers some of the best private salmon and trout fishing in the county on the picturesque, 11⁄2-mile stretch of river that meanders through the grounds. Castlemartin House, which overlooks gardens designed by Lanning Roper, is grand but not overpowering, with fine reception and entertaining rooms on the ground floor, along with a library and several more intimate family rooms. Upstairs, a palatial master suite includes ‘his and hers’ bathrooms and a large dressing room, plus nine more principal bedrooms. What you see is what you get at Castlemartin, where sound, long-term investment and meticulous attention to detail will continue to pay off for years to come. Whatever the background to the sale, schadenfreude is unlikely to play a part in the decision-making that will surely see a new owner installed before long at one of Ireland’s greatest estates. The recent upturn in bloodstock industry fortunes has certainly raised the hopes of other vendors of prime Irish stud farms, says Ronayne O’Mahony of Knight Frank, who is also handling the sale of his family’s historic, 434-acre Courtown Demesne and stud farm at Kilcock, north Co Kildare, at a guide price of ‘excess €10 million’. The sale includes potentially valuable industrial planning consents (valid until September 2016), which could be exploited at some more propitious time in the future. Courtown Demesne dates from the 2nd century, when it was owned by an Irish prince, although the present Georgian main house was built for the Aylmer family in about 1815, then extended in 1890 and again in the early 1900s. In the mid 1950s, the house was rented by the legendary film director John Huston, before the family moved to the west of Ireland. The present owners, who bought Courtown in 1981, have sympathetically modernised this quintessentially Georgian family home, with its impressive high ceilings, ornate archways, open fireplaces and original sash windows. Surrounded by beautifully maintained formal and walled gardens, it has a manageable 13,450sq ft of free-flowing accommodation, including a grand reception hall, four main reception rooms, a large master suite, five further bedrooms, three further bathrooms and a two-bedroom guest suite. Further accommodation is available in two estate lodges and the two-bedroom Wheel House. 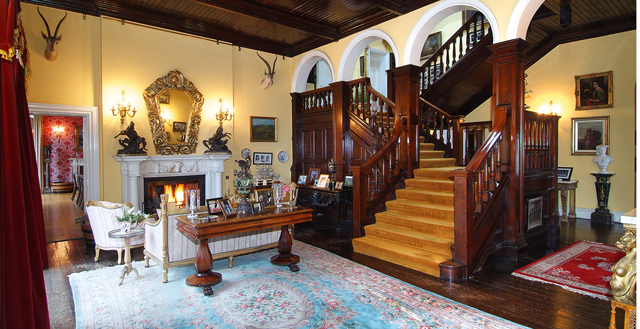 The Georgian house at Courtdown Demesne boasts high ceilings, ornate archways and open fireplaces, as seen in the hall. As befits long-term supporters of ‘The Killing Kildares’, Mr and Mrs O’Mahony have continued to maintain Courtown’s three stable yards, which are in mint condition.  With a combined total of 30 loose boxes, numerous staff and tack rooms, feed rooms and turn-out paddocks, they provide the ideal set-up for an international Thoroughbred or sport-horse breeding/ training operation.